If you are looking for a mindmapping app for your iPad or iPhone, currently SimTech Systems has their MindMapper app for iOS available for free in the Appstore. With MindMapper, you have all the usual capabilities of mindmapping software, and you can save an image file of your maps to your Dropbox account. While you do not have access to editing maps on your desktop like you do with the Inspiration app I reviewed earlier ("Inspiration Maps: Excellent Mapping Solution for iPad"), this app is a fully functional alternative for the iPad. (Besides, the Inspiration app is not free.) The desktop app is available for purchase at Academic pricing from www.mindmapper.com. Though it isn’t clear what that price is. 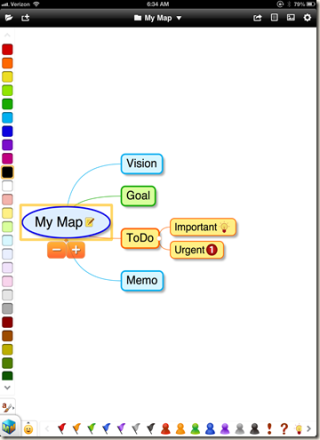 MindMapper app for the iOS is an excellent fully functional mindmapping application. The fact that it is currently free makes it even better. For more information about MindMapper, check it out in iTunes. (MindMapper in iTunes) Also, check out the SimTech Mindmapper web site for information about their desktop application.